Welcome to SCtoC's coverage of the 2018 Cheez-It Bowl. Here, we will preview this match up between the Golden Bears of California and the Horned Frogs of TCU. This will serve as the preview and game thread. 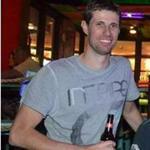 Included will be scoring updates and stat summaries following each quarter, and at the end of the game. We have provided links to the twitter accounts of the team, as well as the account for the bowl game itself. Frequently those accounts will have additional updates leading up to, during and after the games. Here can be found our own complete Bowl Schedule and Rankings. What: The Golden Bears and Horned Frogs meet up in Phoenix. When: Wednesday, December 26 at 6 p.m.
Where: Chase Field; Phoenix, Arizona. 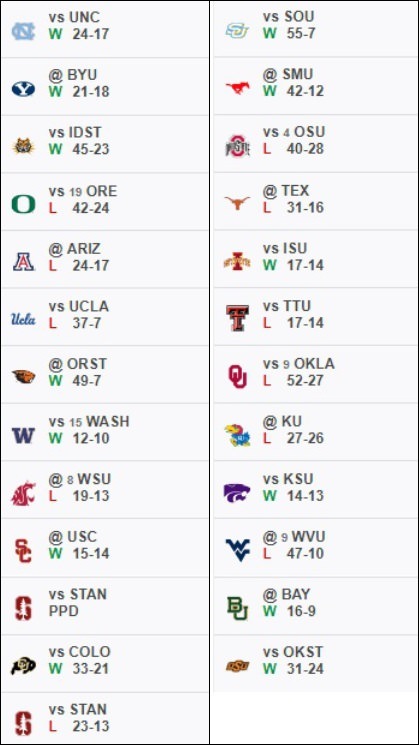 2018 Records: Golden Bears 7-4 (4-4 Pac-12 North); Horned Frogs 6-6 (4-5 Big 12). Head Coaches (overall as HC): Golden Bears - Justin Wilcox (12-11); Horned Frogs - Gary Patterson (166-63). Previous: These teams have never met. Golden Bears Notes: Cal makes its return to a bowl game for the first time since 2015. That was quarterback Jared Goff's final year, and ended in a 55-36 Armed Forces Bowl victory over Air Force. Gone from that era are Goff, now the starter for the NFL's Los Angeles Rams, and head coach Sonny Dykes, who was dismissed following the 2015 season. Enter Justin Wilcox, who comes in at .500 in his first two seasons with the Golden Bears. Cal is 11-10-1 in 22 previous bowl appearances. That includes a 28-0 win over Ohio St. in their first appearance, the 1920 Rose Bowl. The Golden Bears' offense is somewhat diverse, but relies more heavily on the run than the pass. Chase Garbers lines up under center. The redshirt freshman completed 61 percent of his passes for 1,413 yards with 14 touchdowns and seven interceptions this season. He also rushed 90 times for 398 yards and a score. Patrick Laird is just 68 yards away from posting his second thousand-yard rushing season. He leads the Golden Bears with five touchdowns. Vic Wharton III leads the team in receiving with 50 grabs for 502 yards and a touchdown. The Golden Bears' signature this season was their defense, which allowed just 21.3 points and 255 yards per game this season. Horned Frogs Notes: Gary Patterson is in his 18th season as head coach at TCU. He's led the Horned Frogs to 15 bowl games in that time, compiling a 10-6 record (his first game was previous to his full first season with the team). 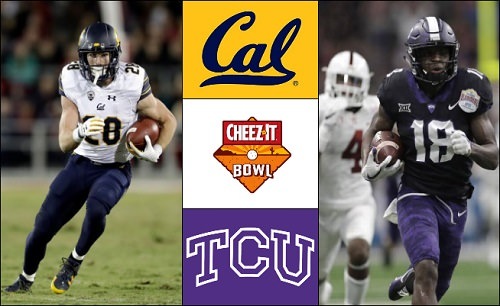 The Horned Frogs won last season's Alamo Bowl, 39-37, over Cal's Bay Area rival Stanford. The Horned Frogs have reached a bowl game in 19 of the past 21 years, with the exceptions being in 2004 and 2013. TCU comes into this game with a 16-16-1 record in bowl games. The Horned Frogs' first bowl game was in the first and only Forth Worth Classic on January 1, 1921 (the end of the 1920 season) when they were defeated by Centre College, 63-7. The Horned Frogs have started three quarterbacks over the course of the season. In their season finale win over Oklahoma St., Grayson Muehlstein got the call. He finished the season 28 of 43 for 328 yards with three touchdowns and no interceptions in two starts. Darius Anderson led TCU rushers with 598 yards off 124 carries with three touchdowns, but Jalon Reagor had 121 yards off five carries with a touchdown against Oklahoma St. Reagor also had eight receptions for 91 yards and another score. He finished the season with team highs of 72 receptions for 1,061 yards and 9 touchdowns. Bowl Notes: This game was previously known as the Copper Bowl, Insight.com Bowl, Insight Bowl, Buffalo Wild Wings Bowl and the Motel Cactus Bowl. This incarnation will be the first under its new moniker, the Cheez-It Bowl. The game was first played in 1989 when Arizona defeated North Carolina St. 17-10. Cal has appeared in the game twice, winning both times (17-15 over Wyoming in 1990, and 52-49 over Virginia Tech in 2013). TCU is making its first appearance in this bowl game. The site of this year's Cheez-It Bowl is Chase Field, the home of Major League Baseball's Arizona Diamondbacks, located in downtown Phoenix. Graphic Credits: Above left: Golden Bears RB Patrick Laird (photo by Marcio Jose Sanchez/Associated Press). Above right: Horned Frogs WR Jalen Reagor (photo by Eric Gay/Associated Press). Heidi is stuck in traffic, but she will be here to bring you all updates as soon as she can. There will be none of that! We are at 5:30 to go in the 1st. Cal just punted. TCU with the ball at their own 17 yard line. Score is 0-0. Cal just intercepted Grayson Muehlstein and take over a the TCU 40 yard line. Jaylinn Hawkins on the interception for the Golden Bears. Touchdown Golden Bears. Chase Garbers 4 yard run. Greg Thomas kick. Cal on the board first. Cal with the ball back via punt. They now have it at the TCU 44 yard line with a first down. TCU's Julius Lewis picks off Chase Garbers. TCU with the ball at their own 38. 1:35 left in the 1st. I'm happy with the Bears defense so far. Got to stop them here though to start the 2nd quarter. Muehlstein is once again intercepted by Jaylinn Hawkins. Cal takes over a their own 17. Well, now Garbers intercepted by Niko Small. TCU ball at the Cal 45.